Planted the right way and at the right time, bulbs are some of the least demanding members of the garden, yet their color and foliage make a major contribution to the enjoyment of your home and yard. Nothing takes the sting out of winter like knowing that bulbs are making root growth under the snow and will be ready to burst into bloom at the first sign of spring. Even better, you can force a few pots of bulbs for a late winter preview of color and fragrance indoors. Some common vegetables illustrate the different kinds of bulbs. True bulbs are like onions with their concentric layers. Tulips, lilies, and daffodils contain a basal plate, condensed stem, leaves, roots, and flower bud. Corms of crocus, gladiolus, and freesias are solid vertical stems with a bud at the top that produces the flowers and leaves. The corm dies off every year and is replaced, often by two or more. Dahlias have tuberous roots like the sweet potato. Eyes or buds are found either at the neck or at intervals on the surface. Tubers, like caladiums and white potatoes, are similar except that they are enlarged stems instead of root tissue. Iris and cannas have rhizomes, swollen horizontal stems at or just below the soil surface. Tuber-corms are often weird-looking bulbs like anemone, ranunculus, and tuberous begonias with one or more buds on the upper surface and roots below. It isn't always easy to know which side is up unless you can spot the buds. 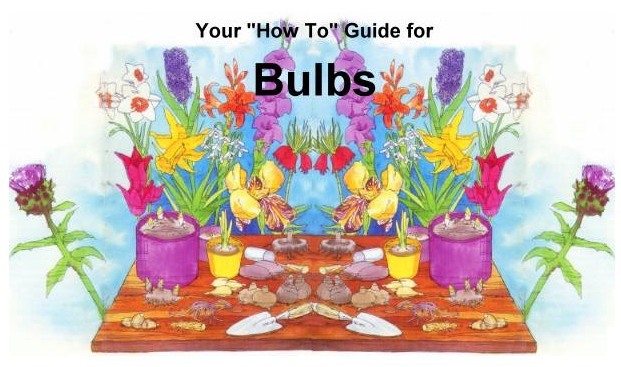 This booklet will refer to all of the above as bulbs just to keep things simpler. All bulbs are either tender or hardy. The tender ones cannot survive freezing and must be lifted and stored indoors over winter (see Bringing in Tender Bulbs). Hardy bulbs can stay in the ground indefinitely. While flower seeds contain only enough food to start the seedling off in search of moisture and soil nutrients, flower bulbs are self-contained, ready to come to bloom on their own. Then the foliage and its chlorophyll, root, and soil nutrients build the bulbs back up again for another blooming cycle. Removing too much of the leaf from a bulb that has finished blooming will impair the rebuilding process and weaken the plant. You can minimize this fading in your garden: bunch and tie the foliage. Daffodil foliage can be twisted into a knot. Cut back the foliage of iris to neat clumps when the tips look scraggly. Surround all bulbous plants with other flowers that will spread and cover the foliage as it fades. With spring bulbs, plant shallow rooted annuals like petunias, snapdragons, and verbena carefully between the foliage even before the tulips bloom. The annuals will grow slowly and not take away from the beauty of the bulbs. You can also plant bulbs among ground covers. Spring bulbs, especially narcissus, are lovely among ivy or vinca in a woodland and will bloom there before the trees leaf out enough to make it too shady. There will still be enough sun to let the foliage slowly fade as it forms next year's flowers. African iris, cannas, crinum lilies, and montbretia will spread in some of the warmer Sunbelt areas, but these are taller and may crowd out the ground covers. Plant grape hyacinths, crocus, and narcissus right in your lawn. Use a bulb planter to cut out a circle of turf, put the bulbs beneath, and replace the turf. The bulbs will come right through. Don't mow the lawn in that area until the bulb foliage ripens in the spring. Most bulbs do best in full sun or very light shade. If the drainage is not good, they will be subject to rot. Where this is a problem, consider raised beds. Plant spring bulbs where you can enjoy them from inside looking out and along oft-traveled paths for maximum enjoyment, not right under windows except near frequently used doors. They can be planted among ground covers or in front of shrubs if you do not have garden beds as such or among perennial or annual flowers. The ideal place for spring bulbs is near a south facing wall that will protect them from north and west winds and at the top of a slope where cold air will drain away. Many will peek through the soil as early as January or February, and ensuing cold, even snow, will not usually hurt them except perhaps to flatten stems. The buds are a bit more tender, but still remarkably hardy. Bulbs will make a much greater impact if you plant larger numbers of the same kind and color together. Uneven numbers give a more artistic effect. Plant larger bulbs like tulips and daffodils in groups of 5 to 25, smaller ones like crocus in clusters of at least 13. By selecting various kinds from winter aconites and snowdrops through daffodils, tulips, iris, lilies, cannas, dahlias, and autumn colchicum, you can have bulbs in bloom from spring until fall. Buy large, firm bulbs, plump and fairly hard, not flaky, soft, moldy or with any defects. Avoid the ones with green tips for they may not grow straight in your garden. Top size may not be necessary, but don"t get any that are too small. Beware of bargain offers. Poor quality is a waste of time and effort in planting. Plant as soon as possible after purchase. Growers in some parts of the Sunbelt must forego the traditional bulbs unless they want to force a few pots with refrigerator treatment (See phase one under Forcing). But there are many exotic bulbs that are well adapted to such gardens. You may want to plant deeper in sandy soils. In the chart that follows, bulbs that will grow in Florida (N stands for northern Fl) will also do well in humid coastal regions. Those that do well in CA will thrive in dry climates if watered. Achimenes FL Jan-April 5" 2"
Agapanthus CA, FL Jan-March 1" 18"
Amaryllis CA, FL Sept-March 1" 12"
Anemone CA, FL Nov-March 2" 12"
Caladium FL Dec-May 2" 24"
Calla lily CA, FL Fall-March 1" 12-24"
Dahlia CA, N FL Nov-March 4" 12"
Eucharis lily FL Jan-April 1" 12-24"
Fairy lily CA, FL Fall-Nov 1" 3"
Freesia CA, FL Sept-Oct 4" 4"
Gladiolus CA, FL Spring-All 2-5" 6"
Gloriosa lily FL March-All 1" 18"
Iris, bulbous CA, FL Nov-Spring 4" 6"
Ixia CA, FL Fall-Feb 3" 3"
Lycoris CA, FL Aug-Mar 3" 4-6"
Montbretia CA, FL Nov-April 3- 5" 12"
Ranunculus CA, FL Fall-Spring 2" 6"
Sparaxis CA, FL Fall-Nov 3" 4"
Watsonia CA, FL Aug-Fall 5" 6"
Spring-blooming bulbs such as tulips, narcissi and hyacinths must be planted in Fall-narcissi and the small bulbs like crocus in early Fall (September)- Tulips and lilies as late as the ground is workable. Fall-planted bulbs should be planted in specially prepared beds which possess good natural drainage. The most satisfactory soil for growing bulbs is a fibrous loam well supplied with sharp sand and bone meal. Tulips should be planted deeper than indicated (to 1 inch) if soil is not too heavy and their location is permanent. Deep planting prolongs the effectiveness of the tulip bulb. There are two methods of planting. You can dig out the entire area to an even depth and place all bulbs at once. This works well for more formal planting. Or you can dig separate holes for each bulb. 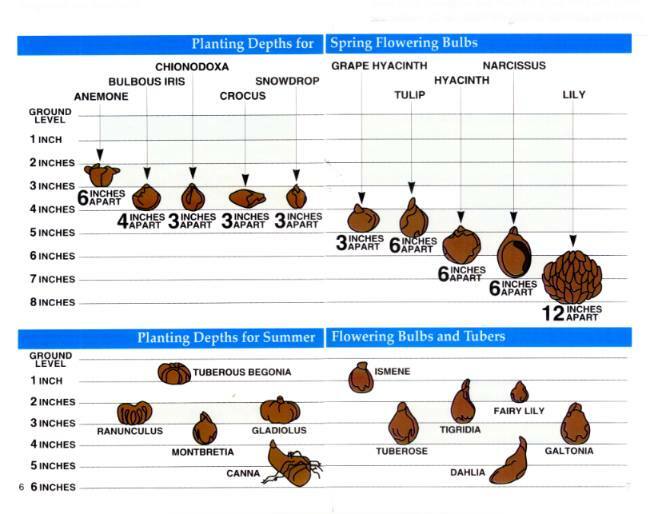 For bulbs not shown on the chart, a general rule is to plant deep enough so that from the top of the bulbs to the soil surface is 2 to 3 times the greatest diameter of the bulb for larger bulbs, 3 to 4 times the diameter for smaller ones. Distance apart should be 1-1/2 to 2 times the planting depth for larger bulbs, 2 to 3 times the planting depth for small ones. Plant deeper in sandy soils, less deep in heavy clay. Like all plants, bulbs will do better in soil improved with humus like compost and peat moss that will hold enough moisture, but not too much. Bulbs are mostly self feeding at first, but it is good to stir a pinch of slow acting bone meal into the bottom of each hole. Hardy bulbs should be fertilized once a year in early spring with an all purpose garden fertilizer according to label directions. Spread this over the soil or mulch just as growth starts. Repeat after blooming if plants lack vigor. In very sandy or poor soils, as in Florida, summer flowering bulbs may need additional applications. Water soil well after planting and again before the ground freezes if dry. Bulbs also need ample water during the time from bloom until the foliage yellows and dies down. Do not pinch back the stems of bulbs as you do with some annuals or you will lose the bloom. After the blooms fade, remove the flowers unless you want seed. Let foliage ripen and die down naturally. Mulching, one of the wisest garden practices has two functions for bulbs. Place leaves, straw, pine needles, or other loose material over them to a depth of about 2 inches after the ground freezes. This will keep the soil temperatures more even through the winter and prevent soil heaving from alternate freezing and thawing. Pull mulch back just enough in the spring to allow the sun to warm the soil and the stems to penetrate. Mulch between clumps will keep weed growth down and moisture constant. Cultivate unmulched soil routinely, especially in early spring. Mulch can also be stirred or cultivated lightly if weeds appear. Whenever you find rot, mold, or other defects on stored bulbous parts or those you are dividing, cut the diseased part away and treat the cut with a powdered fungicide or by soaking in a weak solution of household bleach, 1 tablespoon to a gallon of water. As a rule, most bulbs have few pest problems. If foliage shows holes or plants seem weak, if you see aphids or spotted foliage, improve the air circulation and spray with insecticidal soap. Remove and destroy infected parts. If trouble continues, bring a leaf to your cooperative extension office, to a plant clinic, or to your garden store. The latter will direct you to choices of pesticides. Bulbs, especially summer flowering ones, do well in pots, urns, window boxes, and other decorative containers. Holes in the bottom for drainage are important, for bulbs can rot in water logged soil. Do not use metal containers that will corrode. Plant as you would for either outdoor planting or forcing. Be sure that the soil does not dry out. Containers will need watering much more often than in-ground plantings. A good potting soil mixture should contain one third soil, one third humus like peat moss or compost, and one third sterile soil-less medium like vermiculite or perlite. To each gallon add 1 tablespoon of lime and 1 of superphosphate or bone meal and 1/2 tablespoon of a balanced garden fertilizer like 8-8-8. Divide potted bulbs when they fill the pot and do it just as their growing season begins. Be careful to disturb roots as little as possible. You can increase your bulb stock, much like perennials, by dividing and planting offset, clumps, or seeds. And the more increase you want, the more often you dig and divide. Dig the clumps as soon as the foliage dies down. Use a spading fork and dig far enough from the clump so as not to pierce any bulbs. Separate the individual bulbs, dip cut surfaces in a powdered fungicide and reset them at once, but now each clump will cover a wide space. Smaller bulbs may take one to three years to bloom. Plant in a nursery area until they are large enough. For corms: Save small cormels when digging up bulbs. Plant these in a nursery row and grow on to blooming size. For tuberous roots: To divide a clump of dahlia bulbs, use a knife to separate the root clump. Be sure that each section has a bud, a part of the stem, and one or two tubers. Before winter settles in, dig all tender bulbs and store in cool but non-freezing places. If you can"t duplicate ideal conditions, come as close as you can. Either label the individual tubers or store like varieties in marked boxes or bags. Achimenes begin to go dormant when the lower leaves start to shrivel. From then on withhold water. When the stems are completely dry, cut them off and store the pots, baskets or dug bulbs in a dry place, ideally at 60 degrees. Turn pots of tuberous begonias on their sides until dry. Then remove the soil once the top growth has dried. Leave on the larger roots. Store in a dry, airy place, 45 to 50 degrees, in shallow trays or boxes, either uncovered or very lightly covered with dry peat, vermiculite, or sand. Caladiums like a warm dry place. Put them in an out-of-the-way cupboard in the kitchen. In the Sunbelt where the soil does not freeze, these and other tender bulbs can stay in the ground. Cannas and dahlias are less fussy. When a frost kills the top growth, cut off the stalk to six inches above ground. Leave for a week or ten days for the tubers to ripen thoroughly. Then dig very carefully with a spading fork. Rub off most of the soil and turn the clump of tubers upside down to let the rest of the sap drain out of the stem. Leave them exposed to the sun and wind for several hours to dry completely. Store in a dry place at 45-55 degrees. These shrivel less if covered with dry peat or sand. Dig glads when the foliage turns yellow, about six weeks after blooming. If still green when frost hits, dig and leave foliage attached until dry. 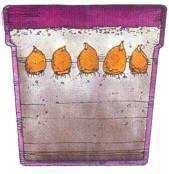 Save the tiny cormlets that surround each bulb and store in a paper sack. They will make blooming size bulbs in two to three years. Remove and discard the old mother corm and roots. There are usually two large new corms to each plant. Store these in a 45-50 degree cellar with high humidity. Don"t put all your bulbs in the ground. To enjoy these self-starters early indoors, select large, healthy bulbs of daffodil, narcissus, hyacinth, crocus or tulips. Check recommendations on the package or in a catalog for the varieties that are best for forcing. Buy some extras, too, for these make great gifts. Some bulbs are extra easy. Colchicums will bloom from a bulb set on a windowsill-no water, soil or pot. One bulb-like corm will produce a succession of flowers within a few weeks exposure to light. Paperwhite narcissus force almost as easily and have a wonderful fragrance. Just put them in a shallow bowl of pea-size gravel with the bulbs just touching each other. Fill the bowl with water not quite to the base of the bulbs and then surround the bulbs with more gravel so just the necks show. Keep the water at the same level throughout growth. Hold these in a cool, dark basement for three weeks or put in a bright, cool spot at once for an earlier bloom. Paperwhites are the only narcissus that will thrive outdoors in Sunbelt areas. All other bulbs require three phases after planting in clean pots. Use potting soil mixed with one-third to one half peat moss and/or vermiculite to hold moisture. Set bulbs close enough to barely touch, pointed end up, deep enough to cover the necks by half an inch and leave a half inch space between soil and rim for watering. Plant all one variety in each pot so all will bloom at once, label with variety, color, and date of planting, and water well. Phase 1 is winter to the bulbs. They need 8 to 15 weeks in a dark, cool, 35-50 degree spot, a refrigerator, basement, garage, or a trench outdoors well enough covered with hay or leaves so they won"t freeze. Apartment dwellers can use a picnic cooler on the balcony, set against the building and covered with a blanket. When the pot is full of roots-tip the soil out of one pot to check-you can begin bringing pots to warmth, one or two at a time to prolong the blooming season. Phase 2 is transition. The shoots will be almost white. Put pots in a cool, 50-60 degree place that gets indirect or very diffused sunlight until the tips turn green. Water as needed. Phase 3 is bloom-time, spring now to the plant. Set them in a sunny window or under fluorescent lights in a cool, 65-70 degrees spot. If stems get too tall, support with stakes. After blooming, forced bulbs will have depleted strength and probably skip at least one year of bloom, so you may want to discard them. They will, however, eventually regain strength and are fine for naturalizing. Here are some to consider as you begin to expand your garden. Here are some to consider as you begin to expand your garden. Crocus are the first flowers up in the spring in many yards. Like winter aconites and snowdrops, they can appear before all snow is gone. Plant crocus bulbs in September or October about 3 inches deep and 2 to 3 inches apart. 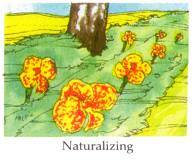 Naturalize some in the shade of deciduous trees where the grass will grow slowly in the spring and need little mowing. Crocus increase readily from both corms and seeds. Hyacinths are more formal and fragrant and some bulbs may be precooled or grown only in water. For these, follow label instructions. If the flower stalk starts to open while lost among the leaves, wrap a tube of dark paper or cardboard around it to force the stem to stretch to the light. Narcissus come in seven major forms, of which trumpet and cupped daffodils and jonquils are the most popular. Picked for floral arrangements, most varieties can be enjoyed for several days and will last longer in shallow water. Tulips, the legendary symbol for the Netherlands, are known and grown virtually around the world, but are best adapted to climates with cold winters. Cut flowers last several days in arrangements and can also be kept for days in the refrigerator in the about-to-open bud stage for special occasions. There are a wide variety of tulip species from low ones with large flat or long pointed flowers to the tall ones we know so well. Some will bloom from earliest spring until almost June. Mice are very fond of tulip bulbs and if yours don"t come up, they are probably the culprit. Moth balls in the holes may help some, but the only sure way to keep them out is to plant the bulbs in wire baskets. Dahlias are most often planted as a tuber and will bloom all summer long. They can also be started from seed, preferably sown early indoors, or bought as bedding plants. Available in a wide choice of form and color, the dahlias can make a season-long garden show. Lift and store indoors. Before replanting the next spring, large root clumps can be divided to produce more plants. Gladiolus, with their swordlike leaves and spires of blossoms make beautiful background plantings for your garden and also provide long-lasting cut flowers. If you want them mostly for bouquets, you can plant them in rows in the vegetable garden. Some may reach up to 6 feet in height, depending on variety, and may need staking. Bulbs of these sun-loving plants should be lifted in the winter in Canada and all but the Sunbelt states. Plant cormels in a row, not quite as deep as the large bulbs, the second spring and the largest of them may bloom next year. Iris, named after the rainbow, are available in almost a complete spectrum of color, and sold in a wide range of varieties, each adapted to particular garden settings. The three-part blossom is characteristic and is the inspiration for the stylized fleur-de-lis of art and heraldry, as used in scouting emblems. The plants usually thrive with little need for extra watering or fertilizer, and rhizomes should be planted at or near the soil surface. Plant bulbous iris according to size-at a depth of about three times the height of the bulbs. Lilies make up another large family that provide a show of flowers from spring to mid-summer, depending on variety. Some are wonderfully fragrant, others have little scent. Most are adapted to cold and are not difficult to grow given excellent drainage, adequate moisture through the season, winter and summer mulch, full sun, some wind protection, and good air circulation to prevent disease. Many can be planted in the spring or late fall. Multiply by seed or scales or bulblets. Tall varieties may need staking. Be careful that stakes do not pierce bulbs. Some facts may vary by region. Please check with your local lawn and garden dealer if concerned about possible variations.